The first interchangeable rod and hard wire cat toy! Designed for in air bug prey huntin! The interchangeable Bug hunter prey attachment. The Bug Prey is fixed to a stiff but flexible wire and a female fixing on the other end to attach to the rod. We currently have a Bug prey choice of Dragonfly, Firefly, Locust, wasp, ladybird, Wormz and Buttermoth. Ave 50cm long plus Bug. Simply attach a different bug prey to the rod and play away! Highly Recommended for use in Play therapy for behaviour issues and combating weight issues. Used regularly, This toy as play therapy can help with shy/ nervous cats and different kinds of aggressive feline behaviours. 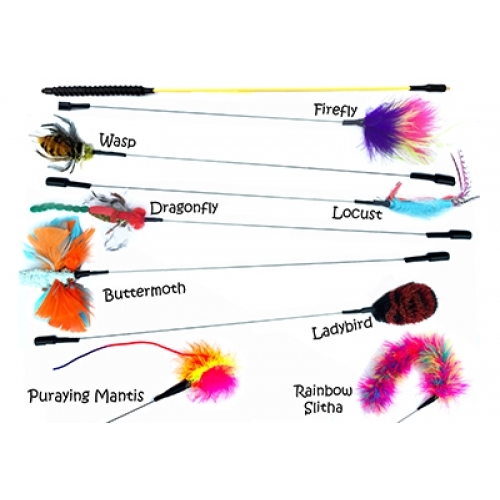 To complete a cat's natural hunt, catch, kill, eat cycle, use the Purrs Rod toys as hunt/chase exercise toys and some real feathers for the kill instinct and cat treats for afterwards to complete the cycle.